The calendar may have said November, but earlier in the month Mother Nature had some major hot flashes. Two weeks ago the temps were in the high 70’s breaking all sorts of records, but finally the Autumn weather has settled in here in the Mid Atlantic area. As previously stated, the only thing I really liked about Daylight Saving Time was having a brighter morning to photograph OOTD pictures. However, depending on the time, some mornings the sunshine can be intense and overwhelming as you can plainly see from this picture. I think I may have also mentioned in previous posts that I prepare my outfits for the entire week on Sunday nights, undoubtedly I must have missed the weather forecast for this week when I chose to wear this particular outfit. It was however comfortable despite the temps nearing almost 80 degrees! 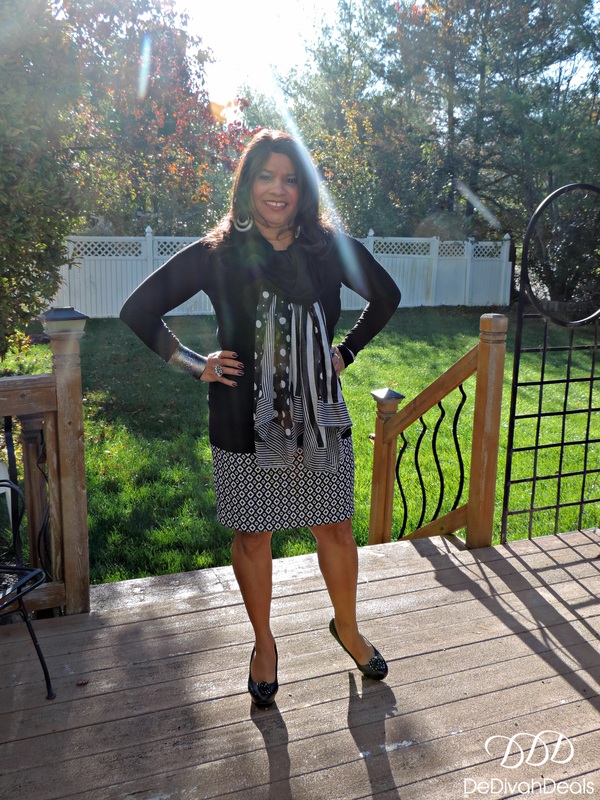 Long sleeves and cowl neck shirts are my favorites especially paired with pencil skirts and this one was purchased a few seasons back from JCPenney. Ever since they closed the store in the Exton Square Mall which was very convenient to shop at during my lunch hour, I haven’t had an opportunity to visit any the other locations. I had always loved their clearance racks and they always had the cutest pencil skirts out of all the other retailers that I have shopped. These shoes were purchased from Ross, my “Betty Boop” shoes as I like to call them are quite comfortable because of the platform. 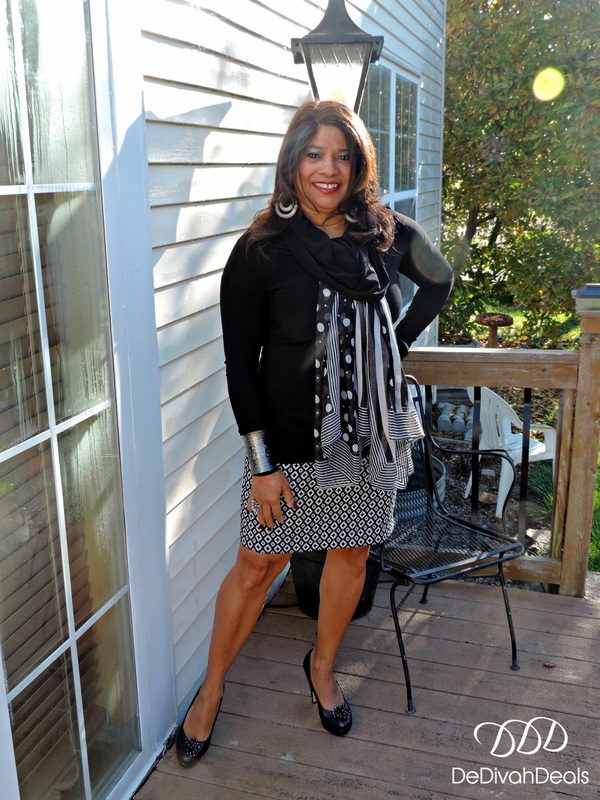 The scarf was purchased from Avon and it makes a great “mix and match” print when paired with the skirt – what do you think? 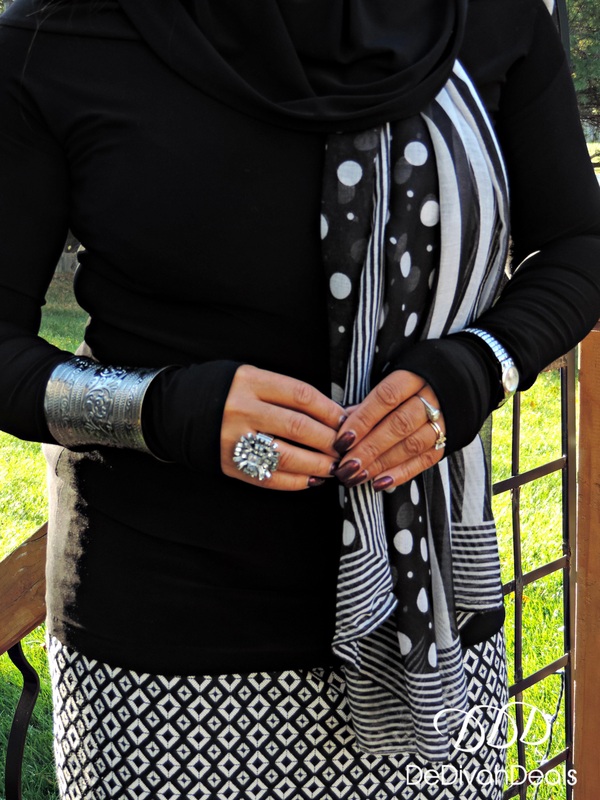 The other accessories are silver tone which I normally pair with black and white outfits. Soon it will be time to bring out the big and bulky sweaters of which I recently thrifted a few at the local Goodwill store in West Chester. When you get a chance, go check out the mini haul video on my YouTube channel and let me know what you think. Have you started your holiday shopping yet, if not, check out the latest Avon catalog for some great holiday gift ideas!